Freddy Carroll is the featured artist at MAC 650 Gallery & Artist Co-Op, 650 Main St. 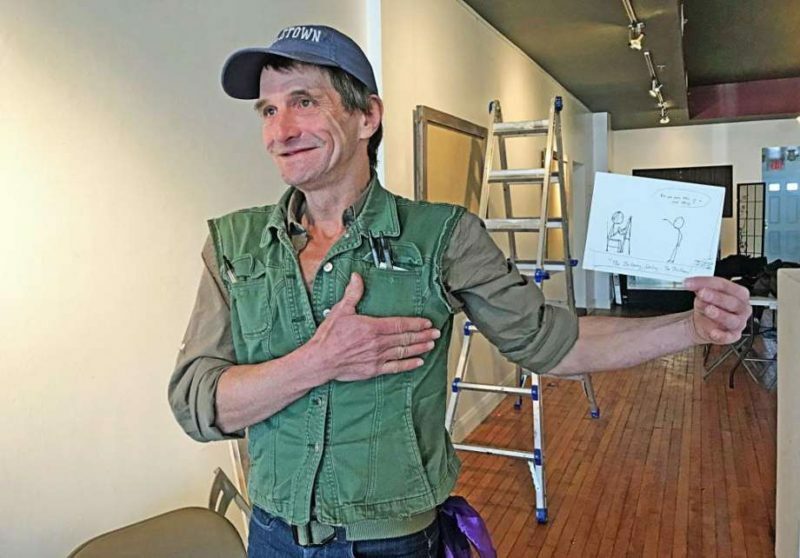 The opening reception for “Fred Carroll: The Collections”for two weeks starting January 20 to February 3 from 7 to 11 p.m. Over the years, he’s been creating stick figure commentaries: simple pen drawings, which touch on politics, current events, education, philosophy and more. The show represents the last decade of his work. Carroll is homeless in Middletown “by default. I didn’t choose it, I fell into it,” said the artist, who euphemistically explained he lives “between pallet and tarp.” Read more about Freddy here. Freddy Carroll, self-proclaimed, ‘Bum with a Broom”. His art now on display at MAC650. Read more about him here.